Antiquaires since 1970, siret: en 24.430113233 ___________. 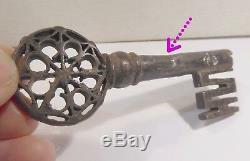 Key of the seventeenth, called Venetian, in average state. 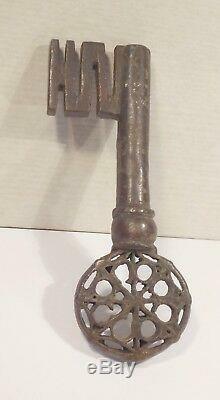 A beautiful key high time, Venetian style. 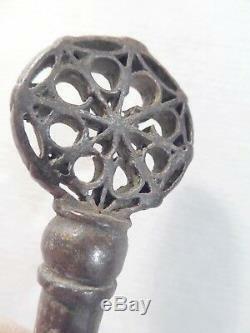 Beautiful round ring filled with an iron lace rosette, turned base, hollow stem of good diameter, bitted zig-zag bit. Work of the seventeenth century. Dimensions: 10.5cm x 4cm. Condition: well worn, stem deformed in places, a plugged hole. Our warranty commits us as follows: we are not experts, but we refund 100%, without questions and with our apologies, any person disappointed by our shipment, within the reasonable period of 15 days. No risk for our customers! The sending of this object 0 for France, and 20 for Europe. 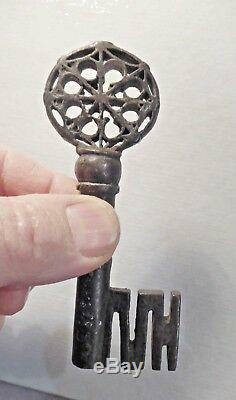 Venetian key 17th c, sad condition. A beautiful high key, venetian style. Beautiful round ring filled with an iron lace rosette, turned base, hollow stem of good diameter, bitted in zig-zag. Work of the seventeenth century, dimensions: 10.5cm x 4cm, condition: well worn, stem deformed in places, a plugged hole. Lace ring with small gaps. 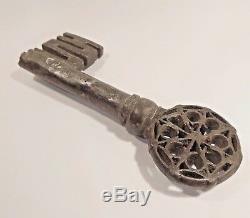 The item "key of the seventeenth, called Venetian, in average condition" is on sale since Tuesday, March 26, 2019. It is in the category "art, antiquities \ objects of the nineteenth and before". The seller is "dany46" and is located in Bellegarde.